EP 01: Location, Money or Lifestyle. The Rule of Three. 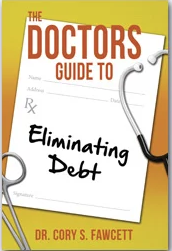 Dr. Fawcett is a man on a mission; to teach doctors how they can live healthy, happy, and debt-free lives–to regain control of their practice, their time, and their finances. He is making an effort to improve the lives of his colleagues. 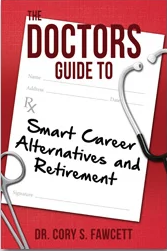 This episode explores the physician job market and looks at strategies to start your career on the right foot. Dr. Fawcett is an award-winning author, speaker, entrepreneur, personal coach, and repurposed general surgeon. He completed his bachelor’s degree in biology at Stanford University, his doctor of medicine at Oregon Health Sciences University and his general surgery residency at Kern Medical Center. After completing his training, he returned to southern Oregon to practice for twenty years in a single specialty, private practice group in Grants Pass. Since 1988 he has shared his home with his lovely bride Carolyn. They have two boys: Brian, who graduated from the University of Oregon with a degree in economics, and Keith, who graduated from Full Sail University with a degree in mobile development. This was back in early 2000s and the healthcare job market has changed considerably since then. Likewise many of the choices to understand the job market did not exist. Today many companies survey physicians to better understand the job market. Salary, demographics, location, job type, length of each job, student loan debt burden, life-style choices and other data. This data primarily helps serve the industry looking to hire physicians but since it is made public can also provide valuable insights to the job seeker. What this data has started to unfold is a changing and dynamic medical employment picture which looks somewhat different from only just 10 years ago. I have attached several of the documents that Dr. Fawcett and I used in our discussion. Location still matters and consider the pros and cons of living a larger versus smaller community. Don’t forget how time and money can be lost if living in a larger city. Beware of larger than average salaries and bonuses, it could be for a reason. Find a mentor as soon as you start your job to help understand the culture and roles that are expected from you. Modern society has shifted from buying things that last to a “throw-away society.” Don’t practice medicine like a throw-away society. Find the right job, significant other, home the first time and try not look at these commitments on the way to the next best thing. 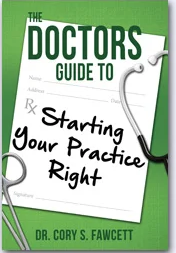 Dr. Cory : (02:11) Yes, I did 3 years of locums work and it was a way for me to taper my practice. Dr. Cory : (03:06) Yes, we took somewhere between 8 or 12 weeks of vacation every year throughout my career. Dr. Cory : (04:48) Dr. Fawcett give tips for taking time off in between residency and post-residency. 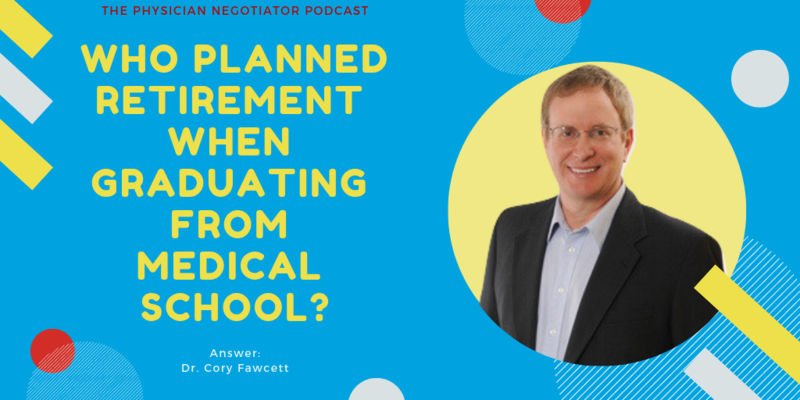 Dr. Cory : (08:03) He gives advice on planning out your entire life starting with residency. Dr. Cory : (10:12) Gives advice on burnout and options. 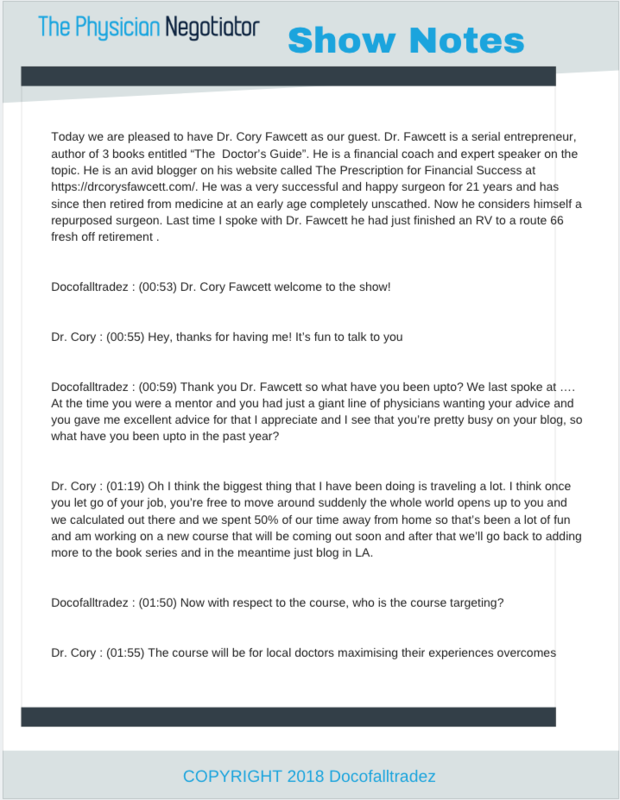 Dr. Cory : (12:00) Discusses that today’s doctor can really have it all. Dr. Cory : (13:03) Work environment matters too. Dr. Cory : (18:09) Changing jobs has consequences for many and may not be a good thing. Docofalltradez : (20:00) Don’t forget about significant others with making career decisions. Dr. Cory : (21:05) Time off versus location. Choosing the right location will impact the time spent on and off the job..
Dr. Cory : (24:55) Rural medicine life versus living in a big city. Dr. Cory : (28:10) Outrages salaries and bonuses beware. Dr. Cory : (30:13) Should you use a recruiter and how to use a recruiter. Dr. Cory : (34:29) Millennial doctors and what they bring to healthcare. Dr. Cory : (39:25) How a Mentor changed his life. Dr. Cory : (43:14) Negotiate a balance with your peers to divide the work.